This is an unreleased cut of DBSK back in 2007 where they appeared on Music Fair 21 with Koda Kumi for the promotion of Last Angel. This is also the same episode where the Backstreet Boys appeared on the show. BSB members are actually beside DBSK but were not caught on camera in this particular cut. Music Fair had a DBSK 5th anniversary (in Japan) special yesterday where they showed some clips of DBSK’s appearance on the show. Suzuki: Good evening, I’m Anju Suzuki. Megumi: Good evening, I’m Toshiaki Megumi. Suzuki: This evening is the Tohoshinki 5th anniversary special, from their debut in Japan. Music Fair will broadcast all the songs Tohoshinki has sung in this program. Megumi: Of course we will send you all of Tohoshinki’s songs, and the gem collaboration songs, too. Jaejoong: I want to hear Koda-san’s type of man in Tohoshinki. Suzuki: We want to hear your honest reply. Koda: Well…everyone has a deep character. All the members are different, in their own way, the sweet and cute parts differ . Changmin is only 19 years old. Megumi: Yes. He is handsome. In this program..
Koda: And Yoochun and Junsu, everyone is so cute. Megumi: So you can’t make your choice? Koda: I love all the members! Megumi: That answer is written in textbooks. *Click thumbnails to view larger version of the pictures. 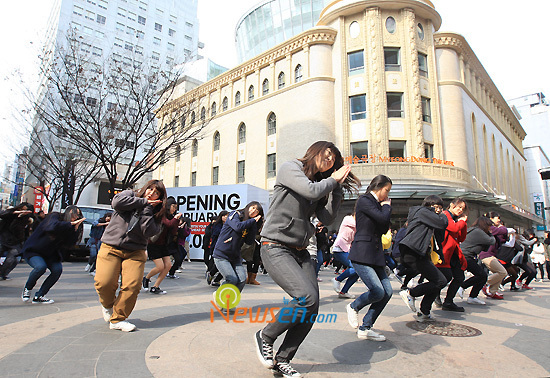 On the 27th in several cities across South Korea at exactly 12:26 pm, Cassies were “Keeping the Faith.” In front of Woori Banks in Gwangju, Busan, Myeong-dong, and Cheongju Cassies performed in flash mobs to Dong Bang Shin Ki’s “Mirotic” in a show of support for DBSK. I’m not sure if this had been brewing for a while or if this is in response to the news of Lee Soo Man stepping down from his position in SM Entertainment and Avex cutting its ties with the company. The news have many wondering what will happen with the current DBSK issue, is this a move towards some kind of resolution or the beginning of the end? Needless to say, Kpop is already in a state of chaos. With Hottests protesting the current public relations snafu of JYPE announcing the definite departure of Jae Park, Cassies must be also feeling a little uneasy. The situation is getting out of control with Hottest claiming that without Jae, 2PM shouldn’t even exist. Over a hundred thousand have withdrawn from their Daum fan site, they are protesting and posting their post its all over JYPE’s building, and are petitioning the shows that other members are on to release them. The year 2010, has gotten off to a rough start for Kpop so far. I’d hate to imagine what would happen if 2PM and/or the ‘Rising Gods of the East’ should disband. In the case of DBSK, I can’t see why SM Entertainment can’t come to some kind of agreement with the band. A happy, working DBSK is more valuable than no DBSK at all. And, after seeing Hottests’ reactions with JYPE I would be afraid of Cassiopeia if I were you, very afraid (you do know that they are the biggest fan club in the world, right?). I’ve gotta say that I was surprised by this news. Usually, info on activities like this are all over the internet days or weeks before fans do it but for this one, I didn’t hear any news or rumor about it. It was really unexpected and a complete surprise on my part. I do not really know if there are other reasons to this but it is said that the Cassies’ intention in doing this is to show that all the fans will always be waiting for DBSK and will always be keeping the faith. I think doing this isn’t a bad thing because they didn’t really cause any trouble (except for traffic, maybe). 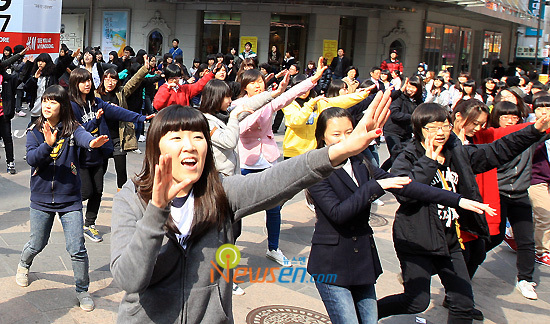 In fact, these girls dancing to DBSK’s songs on the streets probably entertained a lot of people. As long as no violence is involved, I personally think it’s ok.
How about you? What do you think of this, guys? 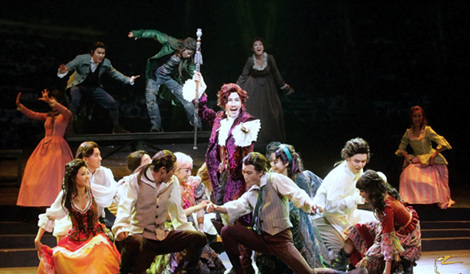 I’ve always like Junsu’s ad-libs when singing songs and I guess his ad-lib expertise was put to good use during his performance in the musical “Mozart!”. LOL. The ad-libs that burst out during tense scenes disarmed the taut tension in an instant and bettered concentration levels. Xiah Junsu, who transformed into a genius musician who dreams of love and freedom and love in <Mozart!>, enthralled the audience with his explosive ad-libs during his last Seoul performance on the 20th. Xiah Junsu, who showcased excellent acting and replayed the life of a musician gifted by God, used his strong connection with his fellow cast members to give the audience a different and joyful experience with unexpected ad-libs. The first moment that caught people’s attention was scene 12. While Mozart mingled with the Weber family under disguise at a fair in Vienna and memorized four letter idioms, he unexpectedly said the words ‘TVXQ’ and ‘Xiah Junsu’. The fans immediately cheered in delight. During the scene in which Mozart meets Constanze and falls in love with her, he slightly lifted up her skirt as we see little children do when they are playing and perfectly portrayed a laid back Mozart. The highlight was scene 14. After Prince Archbishop Colloredo’s distraction causes Mozart to lose a chance to perform in front of the emperor, the musician confronts Colloredo and declares that he will never leave Vienna. During this confrontation, Xiah Junsu blurted out ‘Bbanggoo Ddonggoo*’ and Min Young Gi played off this and said, “Bbanggo Ddonggoo? What’s that?” and “Chamberlain Arco, do you know what Bbanggoo Ddonggoo is?” and made the audience burst into laughter. The ad-libs that burst out during tense scenes disarmed the taut tension in an stant and bettered concentration levels. The ad-libs amidst the rapid pace of the plot gave the show more life and made the experience more enjoyable. *”Bbanggoo Ddonggo” is a name that Haeri from sitcom ‘High Kick through the Roof’ calls people she does not like and has become very popular in Korea. 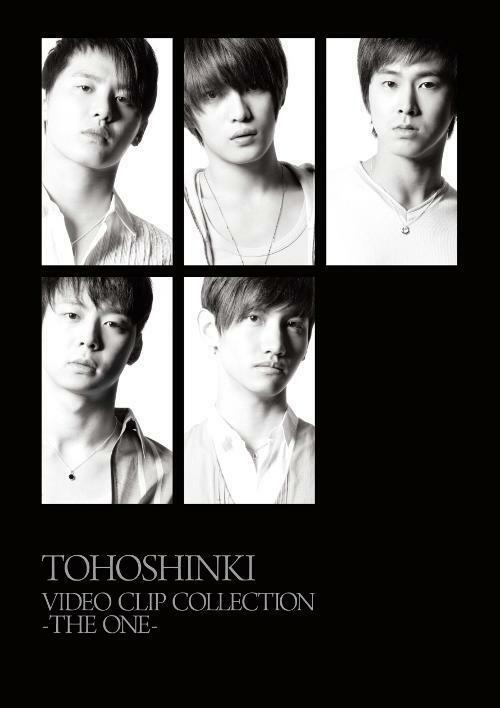 DBSK will be releasing their very first video clip collection DVD and their nonstop mix vol. 2 this March and here are the jacket photos for these releases. There’s nothing exciting about these jackets because there’s nothing new about them. 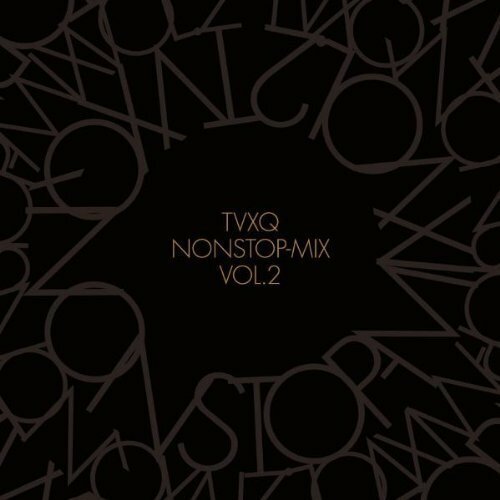 The photos used for the video clip collection are just the same from the pictures included in the Best Selection 2010 album. Anyway to all those fans living in Las Vegas and who are curious of Yunho’s departure date, according to this article he will leave for Las Vegas on March 5. 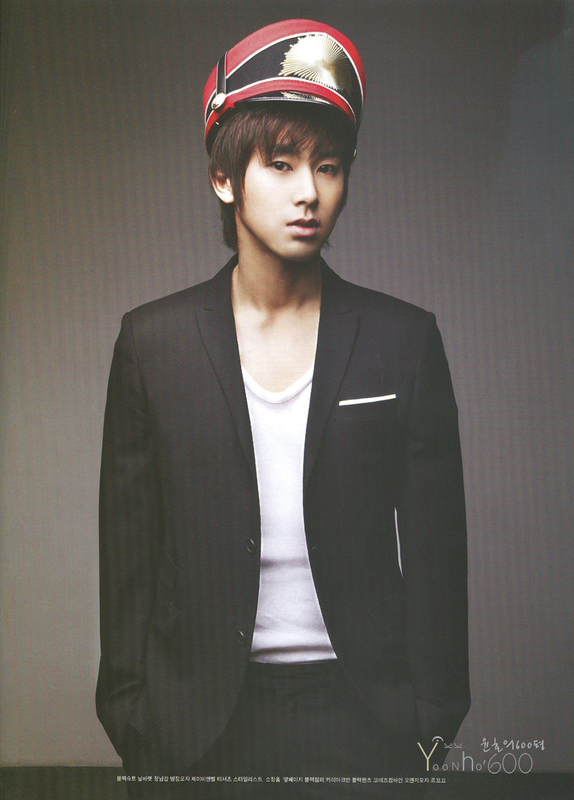 Boy group DBSK’s leader Uknow Yunho has been confirmed to appear and Michael Jackson’s tribute concert’s complete cast has been settled. On the 27th, according to Paragon Music Corporation who’s preparing for the concert said that 2010 is the beginning of the first Korean and U.S. joint project and the complete Korean concert cast has been finalized which will pay tribute to Michael Jackson. The concert title is ‘A Tribute Band from Michael Jackson’s This Is It Movie and U-Know Live.’ The concert title has been changed in order to further highlight the tribute to Michael Jackson and the poster’s image has also been changed to show the concert’s title change. The Korean tribute concert will include American artists Morris Pleasure (*keyboard), Ken Stacey (*vocalist), Vann Johnson (*vocalist), Tony Terry (*vocalist), Samuel Sims (*bass), Joel Campbell (*keyboard), Brian Moore (*drums), Jeff Pevar (*guitar), and Chloe Pappas (*guitar). Other artists who will show spectacular dance performances include Miguel Reyes Santiago, Gianinni Semedo Moreira, Tymika Truss, Josue Vega-Torres, and Maki Saruwatari. Particularly, band master Morris Pleasure was Michael Jackson’s This Is It Band keyboardist. Las July 7, 2009, he was the prominent keyboard player who participated in Michael Jackson’s tribute concert with the This Is It Band. Talented vocalist Ken Stacey is one of the original four vocalists personally chosen by Michael Jackson (for the concert he was planning to do before he died) who participated in Michael Jackson’s tribute concert last July 7 at Staples Center. U.S. vocalists and Korea’s Uknow Yunho will perform King of Pop Michael Jackson’s numbers which received lots of love from fans around the world in the tribute concert. 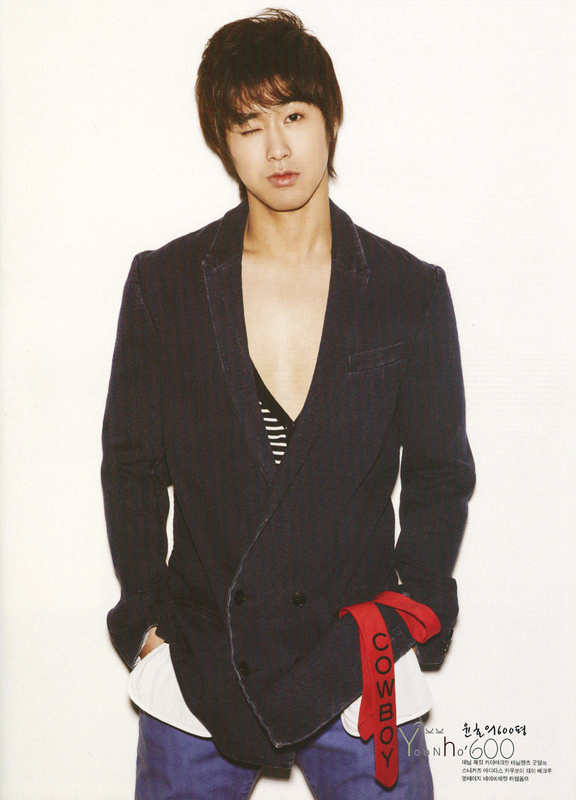 For the sake of the concert in particular, Uknow Yunho will leave for Las Vegas on March 5. In the U.S., he will join the concert team to practice the songs and choreography intensively. They will receive complete guidance from the world reknown Genevieve Cleary who is scheduled to work rigorously with the team on the choreography. 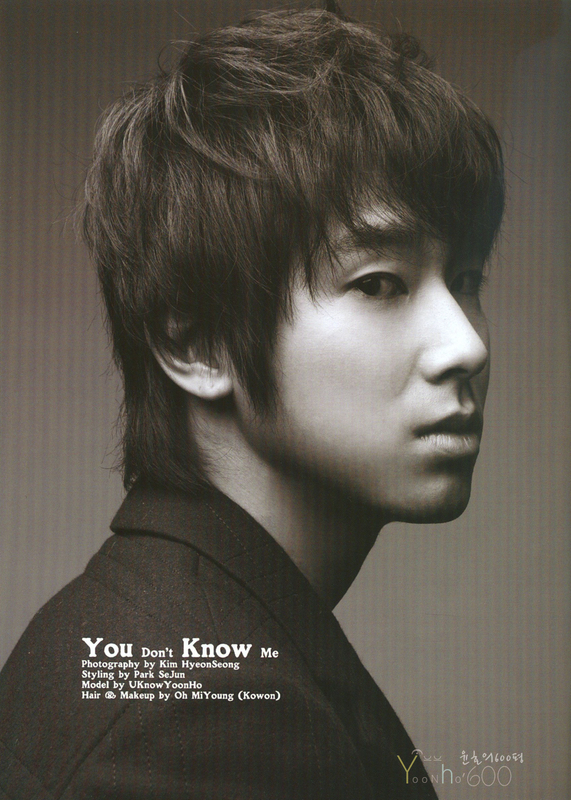 He (Yunho) is expected to return after rehearsing the actual performance several times. The remaining stars, Judith Hill who received lots of popularity for ‘We are the World’ and ‘Heal the World’ and best percussionist Bashiri Johnson who have performed in Michael Jackson’s tribute concert were originally planning to appear in the Korean concert but had to cancel due to personal circumstances. For the 2 days’ performances of Michael Jackson’s tribute concert which will be held this coming March 27 and 28 at Yongsan War Memorial Peace Plaza, the American staff and artists will arrived at Incheon airport on March 25 and they are expected to rehearse for two days on the 25th and 26th. 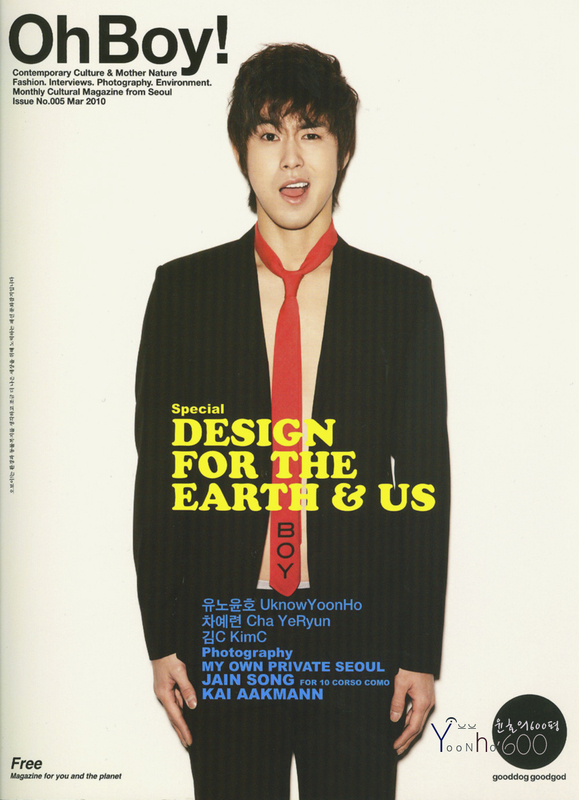 Yunho is featured in the March 2010 issue of Oh Boy! Magazine and some of the pictures where he’s making faces are so cute! LOL. 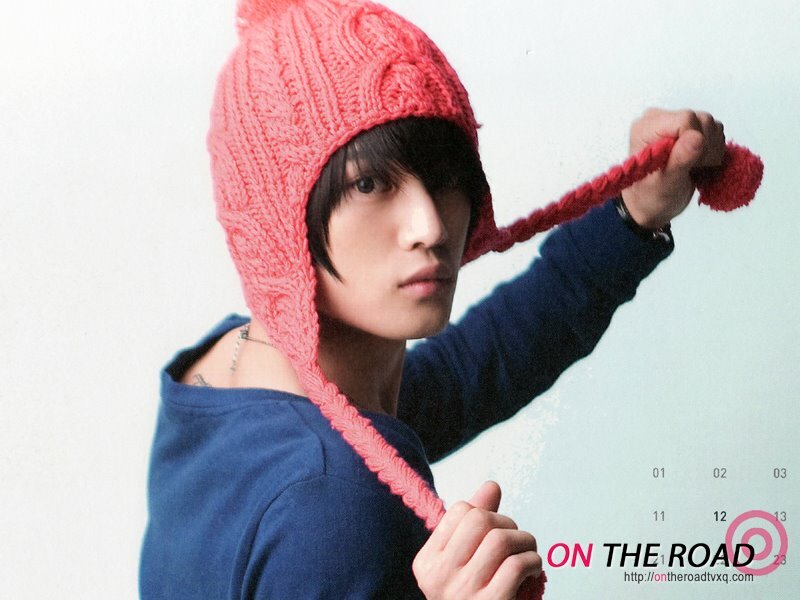 And the red/orange knitted beanie he’s wearing in one of the pictures looks similar to the one JaeJoong wore in one of the desk calendar 2009 pictures. The only difference is that JaeJoong’s beanie is somewhat pink in color, has some designs and the braid at sides are thicker. Oh yes! The number of DBSK fanboys is surely getting larger by the day and just like fangirls, they are now more open in expressing their love for the Rising Gods of the East. 13 years old, Junior high school student: My mom loves TVXQ and since my friends tell me I look like Junsu, I started to see their DVD’s and became a fan. ^^ I have few guy friends who are also TVXQ fans at school and it is so much fun to share new stuff about them with my fan friends. 18 years old, student: My young sister loves TVXQ. 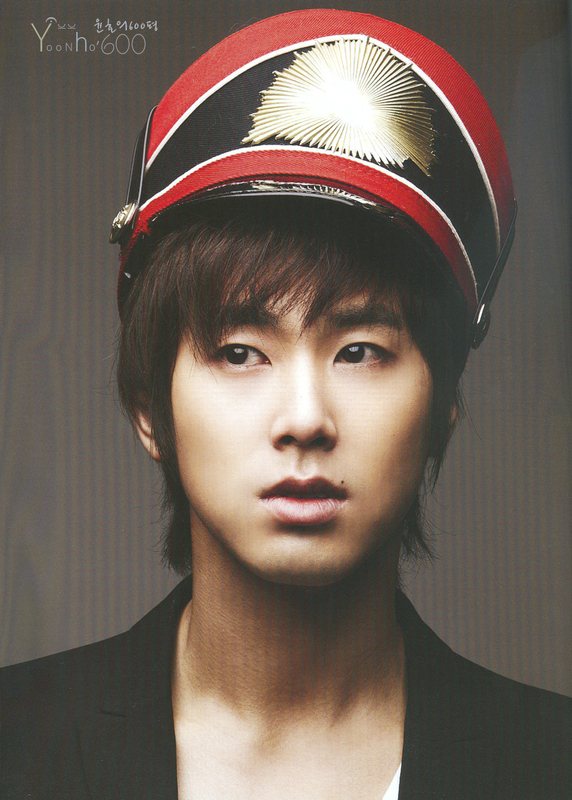 We are so close, so I watched DVD with her, and without knowing how and when it happened, I became fan of TVXQ too! ^^ They sing and dance so well and all five of them look great! I love the fact that they are such a good friends with each other. That’s how we guy friends should be! I purely love all members of TVXQ! 21 years old, student: I am Xiah fan. I am a guy who likes women. But, TVXQ is the guys who look super cool in my eyes. 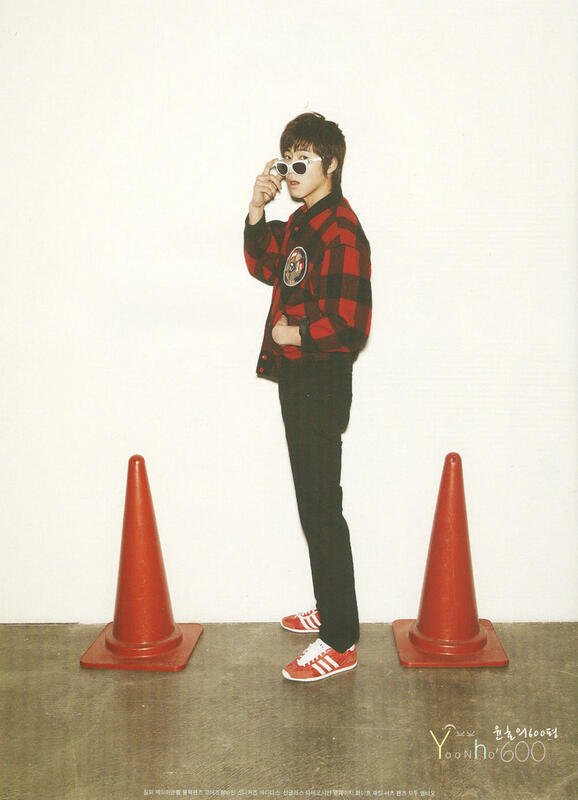 I love “purple line” and I often imitate TVXQ fashion. I would love to find more male fans of TVXQ to be my friend. 25 years old, businessman: I liked backstreet boys in the past. TVXQ is from Korea which is near from Japan so it makes me feel closer to TVXQ and I easily became their fan. When I sing TVXQ song, everyone loves it. (Do I sound like bragging? hahaha.) I wish to know even more about TVXQ!